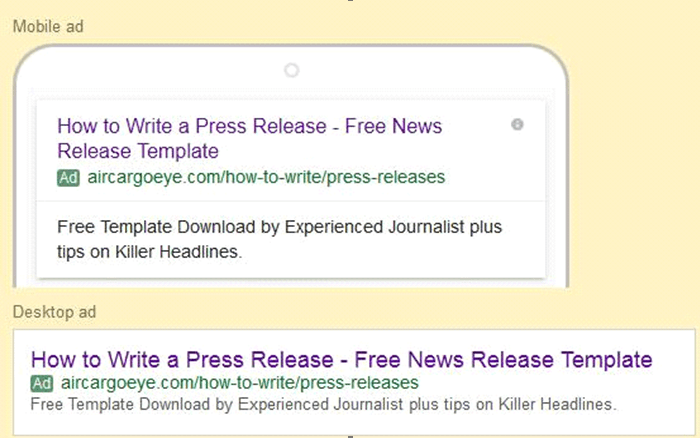 The recent introduction of expanded text ads is one of the biggest changes to Adwords that Google has ever made and has sent agencies and clients scrambling to re-write their ads. The scale of change to Adwords would be like that of FIFA deciding to abolish the off-side rule in Football and simply advising clubs to experiment with the new format! That’s not to say ‘Expanded Ads’ (or the offside rule) are bad ideas as they clearly have many advantages. It does however mean that there are no longer any self-proclaimed experts in Google Ads copywriting – and sadly that includes me! The playing field has been well and truly levelled to continue the football theme! The big increase in character limits for the new headline/description fields is the game-changer. The impact of this is that the copywriting of ads is not something you can do easily in a script or bulk update. The changes need to be made on every single advert if you want to maximise the returns from your campaigns. The mobile world is the main reason for Google making this huge change and follows on from their removal of right hand side ads from desktop search results earlier this year. help your ads work harder across screens, especially for the on-the-go mobile consumer that wants to know exactly what you offer before tapping into your website. If you are a business where the majority of your customers are using mobile devices then you need to start writing your ads straight away since the new format is made for you! It is even more pressing if you depend on location-related mobile searches. Nearly one third of all mobile searches are now related to location with restaurants and stores being the main beneficiaries so if you are one of these you should already have your location extensions enabled. Google suggest that some advertisers using the expanded ads have reported increases of 20% when compared to the older format. This is likely to be on the extremely optimistic side of things and the benefits will likely wear off after a while as the public becomes accustomed to the new format. However, as with most Adwords innovations there is no doubt that there will be some first mover advantages. You might think that simply tweaking your existing ads would be the best strategy because something that has worked in the past should continue to do so. I can’t help thinking of the countless occasions when I was thwarted by headlines that were 2 or 3 characters too long. So I usually settled for shorter, often awkwardly written alternatives! With extra characters available my inclination is to go back to even the best performing ads and look to re-wording headlines and descriptions. It is also a good opportunity to refresh ads and try new ideas. With the near 50% increase in overall ads ‘real estate’ the game has clearly changed so there is no point in obsessing with sticking to past performance. Headlines can and will get truncated if you use the full character limit although the degree to which this will happen depends on pixels rather than character count – ‘w’s take up more space than ‘i’s so aim to be well under the limit if truncation could be a problem. The Ad preview tools should highlight issues. Your headline keywords are still essential for shouting the message or call to action. The second headline field could get shortened so using the first part of the headline may be a safer option. Put the main call to action in the headline fields and more detailed explanation in the 80 characters in the new description field. Mix the call to action and description. Brand name and call to action in the heading plus a very detailed description. With this strategy the call to action in the headline should be quite brief to ensure that it doesn’t get shortened on some devices. The point of this example is that the in-depth information in the long description may turn out to be a strong selling point. A question can often be quite a concise way to make a good point. It isn’t used all that much in Google ads so it does tend to stand out more. In the example from Marketing Labs, our idea was to have a punchy question but then go on to explain more about our services in the description line. 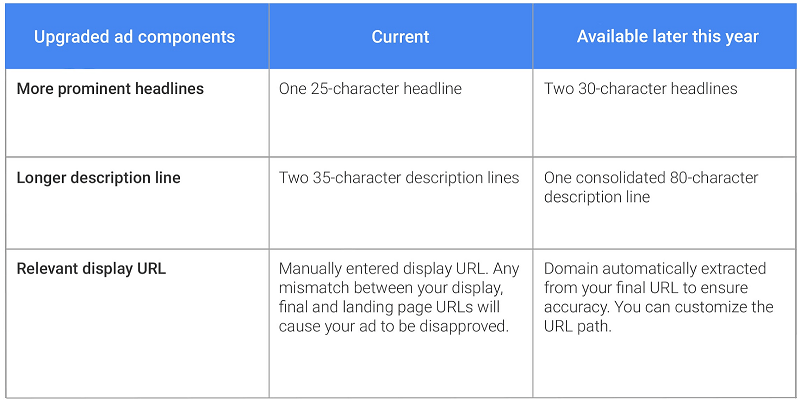 The starting point for upgrading to expanded text ads is still the ads in your existing campaigns. With many headlines you may find yourself repeating the same phrases that you have employed in the past, but continuous innovation, testing and monitoring of your ads performance is the only way to maximise returns. It is certainly worth refreshing your ad copywriting and trying new ideas – all your competitors are in the same boat so there is a real opportunity to gain ground on them. With a longer description and a more prominent headline, I think advertisers have more chance to attract their audience attention. Richard pointed out some very interesting news, Cara. Strategy #4 is the most effective, in my opinion. good news for advertisers, right? Thank you for commenting and thanks again Richard for bringing up these information.